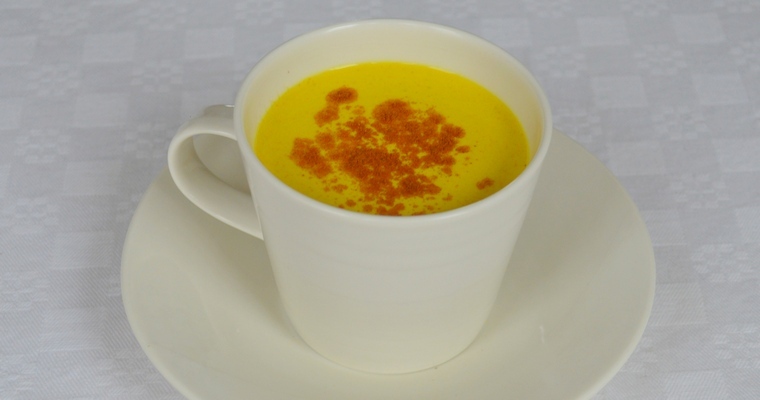 ‘Golden milk’ is a spiced tea that is made by infusing turmeric in rich, fatty nut milk. Turmeric has been consumed for medicinal purposes for thousands of years, and is recognized for its immune-boosting and anti-inflammatory properties. However, the beneficial compound curcumin is not easily absorbed in the digestive system. However, if it is taken with black pepper then the bioavailability of curcumin is massively increased. This combination creates a savoury, earthy-tasting drink, that is similar to chai latte. Some people sweeten the infusion with honey, but I prefer a sprinkling of sweet cinnamon spice on top, which also lends a nice aroma. As the essential oils in spices are fat-soluble, and will not dissolve into water, it is important to use a high-fat milk like coconut milk or nut milk. These are both examples of emulsions, whereby two liquids that should not normally stay together are combined. For example, oil does not dissolve in water, so nut fats will eventually separate out when blended with water. Vigorous shaking breaks down the molecules, dispersing and suspending the fat particles in the water. However, this only creates a temporary emulsion, as the fat and water particles will be more attracted to themselves than to each other. Because emulsions are sensitive to changes in temperature, it is important to heat the milk in this recipe gently, and to turn the heat down as soon as you see little bubbles breaking through the surface. If you heat to the milk all the way to boiling point, the finely ground nut particles will separate out, resulting in a grainy texture. Combine all the ingredients except for the cinnamon in a small saucepan, and whisk until blended. Gently heat to just below boiling point, whisking frequently. As soon as you see small bubbles barely breaking the surface, reduce the heat. Simmer for 10 minutes, then turn off the heat. By this point, the milk will be thicker, with a viscosity that is closer to cream. Drain through a sieve, discarding the pulp. If using dried turmeric, whisk thoroughly to redistribute the powder at the bottom. Pour into mugs and serve hot, with an optional dusting of ground cinnamon. Alternatively, leave to cool and store in an airtight container in the refrigerator. The milk will keep well for up to 5 days in the refrigerator. To reheat, pour the milk into a small saucepan and gently heat to just below boiling point.